is professor of biology at the University of Minnesota, Duluth. His book What Should a Clever Moose Eat? Natural History, Ecology, and the North Woods, will be published in February 2016 by Island Press. When spring arrives in the north, its warmth induces some species to begin their life cycles. Other species are cued by astronomical signals such as longer days. But here’s the catch: species cued by one signal sometimes eat species cued by another. During previous centuries, natural selection and the relatively stable climate allowed their life cycles to synchronise, even though they were responding to different cues. In this century, however, spring is arriving earlier because of global warming, but global warming is not going to change day-lengths, which are controlled by the Earth’s orbit. And so the life cycles of species that respond to temperature become uncoupled from those that respond to day-length. 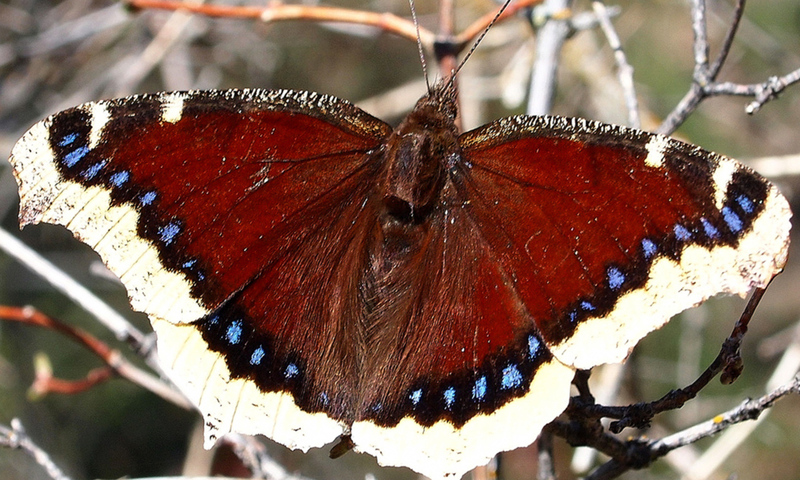 An example that recently caught my attention is the Mourning Cloak butterfly and its food plants, the willows. In Great Britain, the Mourning Cloak is called the Camberwell Beauty; in Sweden, Sorgmantel; in Latin, Nymphalis antiopa. Held in your hand, its wings would span the width of your palm. A row of vivid blue dots separate raggedy yellow borders from dusky‑maroon inner portions on each wing. No other butterfly resembles it. The Mourning Cloak is one of the very first butterflies to emerge in spring in northern Minnesota, where I live. Adults spend winter in hollow logs or beneath loose pieces of bark. Sometime in mid-April, when they are roused by the warmth of the season, they emerge and mate. Females lay their eggs in rings encircling willow twigs. The salt-and-pepper caterpillars, with large red dots down their backs, hatch within a week or so, and feast communally on the willow leaves which, cued by the increasing day-lengths, are beginning to unfold at the same time. But with the warmer springs in this century, Mourning Cloaks in northern Minnesota have emerged much earlier than previously, often in early- to mid- March. In mid-April, days are 14 hours long, but in early- and mid-March, they are 12 hours or shorter, too short to stimulate willow buds to burst forth their leaves. We had a large and very early emergence of Mourning Cloaks on 7 March 2012. The six or seven weeks between this appearance and the unfolding of willow leaves might have starved the caterpillars. The population seems to have crashed; Mourning Cloaks have been very scarce since then. Even this one year when the life cycles of Mourning Cloaks and willows were uncoupled seems to have had long-lasting effects. The uncoupling of these and other life cycles as the Earth warms could severely disrupt food webs. Interactions between species such as herbivores and the plants they eat are the knots in food webs that control the passage of energy and nutrients. Most of these species are small, hardly noticed, and of little or no commercial value, like Mourning Cloaks and willows. But in the coming decades, the uncoupling of their life cycles may portend the disassembly of food webs.